What is the Chesapeake Oyster Alliance? The Chesapeake Oyster Alliance is a multi-year collaborative effort to add 10 billion oysters to the Bay by 2025. For it is only with a healthy Chesapeake oyster population that a restored Bay is possible. The Chesapeake Oyster Alliance will improve water quality, engage new constituencies, and drive economic benefits across the region to accelerate ongoing oyster recovery efforts in the Chesapeake Bay. Who is involved in the Chesapeake Oyster Alliance? A diverse group of partners have committed to making the Chesapeake Oyster Alliance goal a reality. These partners include community organizations, universities, NGOs, and corporate and private partners. Aquaculturists are also important partners in this effort because of their crucial connection to the public and private fisheries where much of the Bay's increased oyster abundance will need to occur. How does this alliance differ from existing oyster restoration efforts? In recent years, recovery of Chesapeake Bay oyster populations has been accelerating due to state and federal agencies' large-scale efforts to restore 10 tributaries along with improvements in water quality, increasing disease resistance, growth of aquaculture on leased bottom, and scientific management of wild harvest. But without an ambitious, collaborative effort like the Chesapeake Oyster Alliance, we will likely fall short of truly restoring this keystone species. By generating new partnerships and sparking innovation, this coalition will accelerate efforts that already show tremendous promise for the Bay's oyster populations, while also bringing new partners and approaches to this rapidly evolving field. Where will the 10 billion new oysters come from? The 10 billion oysters will come primarily from large-scale restoration efforts in Maryland and Virginia that support the Chesapeake Bay Program objective of restoring 10 tributaries by 2025, but will also include oysters planted in the aquaculture industry and wild fishery. 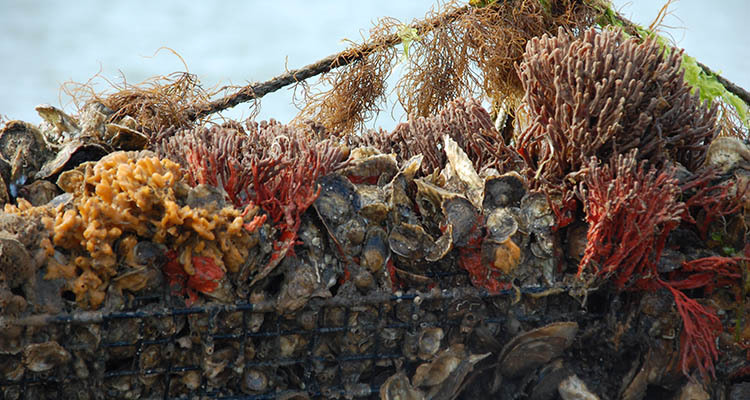 What are the key components of the Chesapeake Oyster Alliance? Experience, adaptive management, and cutting-edge science are teaching us more about restoration every year, but the task is huge. At present, the largest contribution to restoration efforts comes from tributary-scale projects undertaken by state and federal agencies in support of Chesapeake Bay Program oyster restoration goals. We must continue to support these restoration efforts while developing opportunities to improve and expand. Not only will we rebuild habitat and water filtration capacity, but restored sanctuary reefs will produce oyster larvae to disperse to harvest bars as well as sanctuaries. Because more than 75 percent of the Bay's oyster bottom is open to commercial harvest, good management of these reefs represents a significant opportunity to recover the Bay's oyster population. Rotational harvest holds promise for stability in the fishery, but its success will depend on harvesters, packers, scientists, and managers working together. Science-based management should be employed with a goal of substantially increasing the number of oysters on public bars. It will be particularly important to devise a funding system that can make critical, strategic, up-front investments in bottom rehabilitation and spat-on-shell planting that will make the industry self-supporting and profitable in the long-term. Aquaculture provides a unique opportunity to support economic growth in coastal communities while providing sustainable seafood and water quality benefits. Aquaculture in Virginia has grown rapidly in recent years and Maryland's fledging industry is beginning to grow as well. The Chesapeake Oyster Alliance will support the continued growth of these industries to provide economic development opportunities, enhance water quality in the Bay, reduce fishing effort on wild oyster stocks, and provide novel structured habitat for commercial and recreational fishes.